There are many things to love about spring time at Five Feline Farm. Morels Trillium Rain drops on Liliac buds It just doesn’t get any better than this. 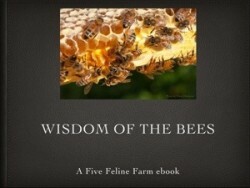 We have been busy here at Five Feline Farm. The temperatures are starting to climb, the grass is greening and it is time to get outside and do all those things that winter prevented. Start the Garden Tender Plants in the Greenhouse Netting Cage for Strawberries Goldfish Pond Reset Fruit Trees Blooming Ahh Spring.